A very special night at The Chedi was held August 1, hosted by the hotel’s guest chef, Jaakko Sorsa, with the aim of promoting his recently published book, “Skapas Dining”. 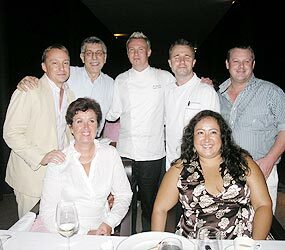 Chef Jaakko Sorsa (centre) with management and guests at the Chedi Hotel. Prior to sitting down for dinner next to the Chedi’s swimming pool, guests at the exclusive event socialised whilst tasting the various scapas on offer—washed down with some excellent wine. Once seated, they were treated to amazing dishes such as prime Scandinavian seafood platter consisting of Baltic herring, beetrot-gravad lax and Dover sole. ‘Signature Veal Wallenberger’ a juicy veal burger served with potato puree, green peas, wild lingonberries and red wine sauce was an immediate success as a new “take” on an old favourite. Limited stocks of “Skapas Dining” are available at the Chedi’s shop; the ingredients necessary to reproduce the delicious dishes may be a little harder to find! An interesting evening including a dinner and a book discussion will be held August 17 at Café Pandau on Soi 13, Nimmanahaeminda Road. The book under discussion will be ‘Sustainable Cities in Chiang Mai: a Case of a City in a Valley’, and is available from Café Pandau at a cost of 1000 baht. Its author, Dr.Duongchan Charoenmuang Ph.D, is the Secretary General of the Urban Development Institute Foundation and a researcher at Chiang Mai University’ Social Research Institute. The book itself is one of a series by Dr.Duongchan on various cities, and examines the history, the current climate and the possible futures of Chiang Mai. Whilst a scholarly work, the book is eminently readable and explores such topics as the origins and history of Chiang Mai and Lanna/Buddhist/animist principles and values as applied to the city’s current challenges of social, cultural and environmental preservation. The author will be present to discuss the book in English and will answer questions and share opinions as well as sign books. Audience invited to dress up as movie stars! On August 16, the Kad Theatre at Kad Suan Kaew will host a special concert to be given by the newly –formed Chiang Mai Youth Philharmonic Band and Symphony Orchestra, entitled “The Soundtrack Concert”. The programme will include much loved tunes from major movies and will feature clips from such epics as Braveheart, Lion King, Robin Hood, Pocahontas, Pirates of the Caribbean and many more. Special guests will include the ‘Chiang Mai Voice Studio Chorus’, who recently represented not only Chiang Mai, but Thailand at the World Choir Games held in Graz, Austria, and came away from the competition with both a silver and a bronze medal. A remarkable achievement for a group which was only formed last year! The concert starts at 7pm and tickets are available at 500, 400, 300, and 200 baht, with a special price for students of 100 baht. To liven up the night, members of the audience are invited to dress up as their favourite movie star! Tickets can be bought at the ground floor Information Desk at Kad Suan Kaew. For further information, please call 053 224 444 x 19008 or 083 474 4751. For last month’s regular lunch get-together, the Expat Ladies’ Luncheon group chose the riverside setting of Duke’s, just as popular at lunchtime as it is in the evening, and found themselves the second ladies’ group enjoying treats that day. It’s a mistake to only eat at this restaurant when you feel the need of a “meat fix”! The steaks, ribs and salads, of course, are superb, but the lighter menu which was chosen in advance for the occasion, (with professional guidance from the “man” himself), was also delicious. For starters, a mixed salad with avocado and artichoke proved incredibly fresh—full of distinct flavours which did not overpower each other. The three choices for the main course were Crab Cakes with Mango Salsa, Chicken Florentine and, for the vegetarians present, Shiitake Mushrooms with Cheese Ravioli. All were light, full of flavour and nicely presented. Unsurprisingly, many of the ladies managed to sample all the dishes. For dessert, the ever-popular choice was White Chocolate Cake with sliced Pear. Rich, light and not over-sweet.. Everyone declared themselves stuffed full—but nobody left even a crumb of cake! No surprise there, then! Coffee and tea finished the meal off to perfection. Definitely an experience to repeat. Enjoying a few minutes in the sun. A local women’s Rotary Club of Chiang Mai, Thin Thai Nam, district 3360, recently held an event at the Chiang Mai Red Cross, to celebrate their “Grandma Cares” Partnership Programme, which helps assist the children of HIV/Aids sufferers and provides psychological and social support to families within Chiang Mai. The programme, which trains grandmothers and other relatives responsible for taking care of children with deceased or sick parents, also provides supplements to the basic needs of these children and their grandparents. Volunteers work with family members who provide home-based care for people living with AIDS. Rotary clubs around the world, plus other clubs, companies and private individuals, are invited to participate in raising funds for the project. Activities of “Grandma Cares” include quality life training, skills for life training, living assistance and education assistance consisting of $400 yearly funding. Grants are paid twice a year, according to the Thai schools term. At present the project has 72 families under its care. held on July 31 at 94 Coffee on Nimmanahaeminda Soi 9. 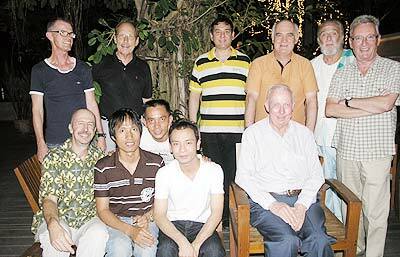 The Long Yang Club Chiang Mai (LYC-CNX) is a new social group promoting friendship between Western and Asian gay men and lesbians, and is part of Long Yang Club International - the world’s largest network of gay Asian/non-Asian groups. There are over thirty-five LYC chapters and member groups in four continents around the globe. Chiang Mai’s LYC chapter was founded in October of last year by a gay couple who saw the need for a social outlet in Chiang Mai that would give gay and lesbian singles and couples an opportunity to make friends and build an extended social network. The group has quickly grown to include a member list of over eighty. LYC-CNX holds regular social events, which have included a buffet lunch, regular Pot Luck/Gay Theme Movie nights, a picnic, coffees, and dessert receptions. There is no cost to join, and almost all LYC’s events are free. Their next event is a monthly Pot Luck on August 14 at a member’s house. To attend, or to become a member, send an email to [email protected] .com and ask to be added to the mailing list. Health & Development Networks (HDN) and the International HIV/AIDS Alliance, creating a new joint organisation with a global mandate as part of the Alliance family. The new organisation, to be based here in Chiang Mai, will build on the Alliance’s presence in 39 countries globally. It will also accelerate HDN’s global implementation of the National Partnership Platform strategy, which will strengthen and promote the inclusion of community voices and views within HIV and TB programming. The new organisation will benefit from HDN’s knowledge management, communication, information and dialogue experience, helping to share learning across the Alliance and beyond. Nadine France, Executive Director of HDN, explained: “Bringing together a substantial country presence with an increased information exchange, dialogue and advocacy capacity will facilitate more coherent civil society voices and mobilisation around AIDS and related priorities such as TB.” Local and national community responses to AIDS and TB are at the core of both organisations’ strategies. Both recognise that civil society has to fight for its place in national responses. The new organisation will take advantage of this shared focus, similar values and common work directions, and, building on lessons learned from recent joint initiatives, will strengthen the position of civil society in this struggle.